Amsterdam’s famous King's Day carnival is held on 27 April and sees over a million people spill into the streets and onto the canals to paint the town orange at one of the world’s biggest street parties. Never experienced King’s Day in Amsterdam before or want to be reminded of just how awesome it is? Here are some fun facts to check out! Could this be the world’s biggest birthday party? Very possibly. King’s Day marks the birth of King Willem-Alexander on 27 April, and everyone in the Netherlands gets the day off work to celebrate. And boy, do they celebrate. Prior to Willem-Alexander’s accession to the throne in 2013, King’s Day was called Queen’s Day (Koninginnedag), and was held on 30 April in honour of the former monarch Queen Beatrix. 30 April was not actually Queen Beatrix’s birthday, but her mother’s. Beatrix decided to keep Queen’s Day as 30 April in honour of her mother – no doubt much to the delight of the Dutch people, since Beatrix’s real birthday falls on a wintry 31 January. Brrr. Orange is worn on King’s Day as a show of pride for the Dutch royal family – the House of Orange-Nassau. So raid your wardrobe, your friends’ wardrobes, your local charity shop and anywhere else you can think of for oranje clothes and accessories, and wear them with pride. If you’re not covered head to toe in orange on King’s Day, you’re not doing it right. Orange wigs and face paint also get a big thumbs up – the wackier the better. Yes, you’ll look like a crazy person. But thankfully, so will everybody else. All that partying sure does work up an appetite, so thankfully you’ll find delicious treats around every corner, with hundreds of street food vendors lining the roads and squares. For those with a sweet tooth, no King’s Day is complete without sampling the local tompouce, a sweet pastry loaded with cream that will be all over your cheeks in no time at all. They are decorated with orange icing especially for King’s Day. If you can’t wait until King’s Day itself, then why not start the party the night before? King’s Night (Koningsnacht) is King’s Day eve, when Amsterdam’s best clubs, bars and pubs welcome hordes of excited revellers to special King’s Night parties and events. Some people carry on the party all the way through until the next day, while some pop home for a few hours’ sleep ahead of the main event. Either way, King’s Night in Amsterdam is a great way to get in the oranje spirit – just make sure you save some energy for the day itself. Amsterdam gets pretty crowded on King’s Day. In fact, with between 600,000 and a million people descending on the city especially for the celebrations, Amsterdam’s population on King’s Day is twice that of any other day. Where do all the people fit? Well, everywhere. Every street, canal, balcony and terrace is awash with orange-clad revellers on 27 April – so don’t expect to get anywhere in a hurry. Just take your time and go with the flow. One man’s trash is another’s treasure, and King’s Day is certainly a day for treasure hunting. A free citywide flea market (vrijmarkt) pops up along every street and public space, with locals and visitors of all ages setting up stalls and turning market traders for the day. Everyone is allowed to sell or trade their unwanted items, and you’ll always find plenty of bargains and interesting trinkets from the attics of Amsterdam’s old houses. If you’ve got kids, then head to Vondelpark where hundreds of children set out their stalls with toys and books. Amsterdam’s canals are flooded with a sea of orange on King’s Day, as thousands of brightly decorated party boats fill the famous waterways. If you don’t have a boat (or a friend with a boat), then you can still enjoy the nautical fun from dry land. The corner of the Prinsengracht and Amstelveld is a great spot to watch the parade of King’s Day boats go by, or of course one of Amsterdam’s 1,500 bridges. While most of the visitor attractions in Amsterdam close down on King’s Day, some museums remain open for those who want to soak up some culture or simply get some respite from the crowds – you don't even have to take off your orange wig! The Van Gogh Museum, the Rijksmuseum, the Stedelijk Museum and the Anne Frank House will all be open this King’s Day. …and there are plenty of parties to choose from on 27 April. From huge open-air dance events to small stages set up in neighbourhood cafes, there’s an event somewhere with your name on it. Just remember to get your ticket in advance as many events sell out and tickets for the major dance festivals aren't available on the day. The biggest parties take place outside the city centre so it also helps to plan ahead. Find out more about the best King’s Day 2017 events and parties. 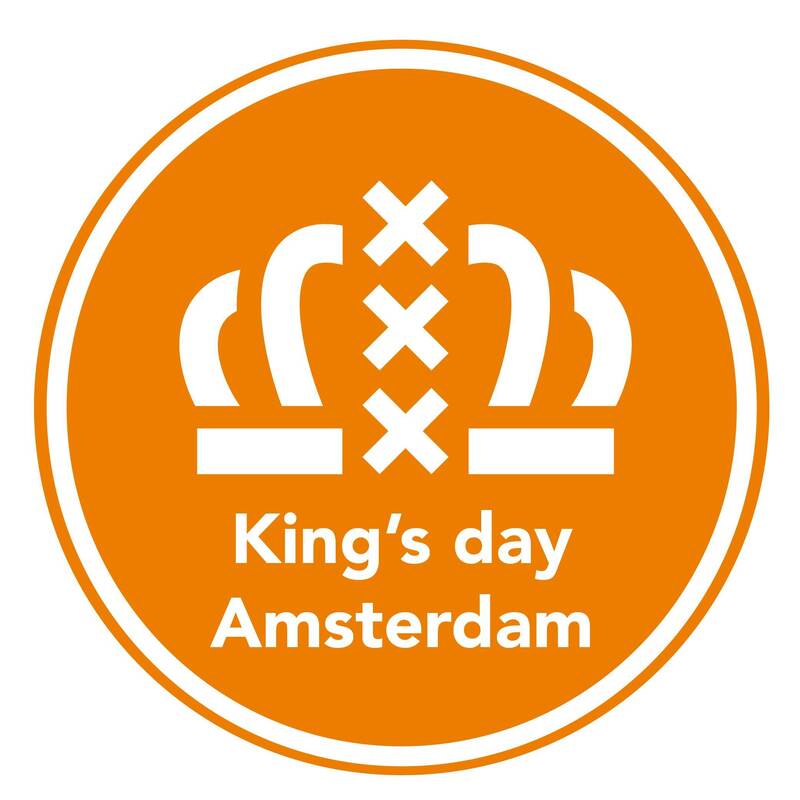 Check out and share our King's Day Amsterdam infographic!